I LOVE Biscotti. And when I eat it I always think about my grandfather. I remember how he would dip his Stella Doro Biscotti into his coffee. Back then I was not a lover of this crunchy cookie, but I don’t think they were as popular or as decadent as they are today. I could be wrong though, since I was just a little kid and had no love for coffee, or cookies that were not a soft and chewy choclate chip. The only Biscotti I ever remember seeing back then was one flavor: Anise. Now they have all different types of flavors, filled with different types of nuts and then dipped in all kinds of chocolate. But my most favorite Biscotti is chocolate with almonds. Not that I would turn down anything dipped in chocolate. (Trust me: It would never happen) . But in this instance, for me anyway, simple is better. Chocolate and almonds being dipped into my coffee: Absolutely delicious. Someone gave me this recipe awhile back and I had never made them. I came across it last week and decided to finally go ahead and try them out. I was pleasantly surprised. Not only were they delicious, but super easy to make. Heat oven to 350 degrees. Beat softened butter and sugar until well blended. Add in the eggs and almond extract and beat well. In a separate bowl, stir the flour, baking powder, cocoa and salt, and add in small increments to butter and sugar mixture, blending well after each addition until smooth. Once blended the dough will be thick but not overly sticky. Stir in the almonds. Separate the dough into two equal parts. 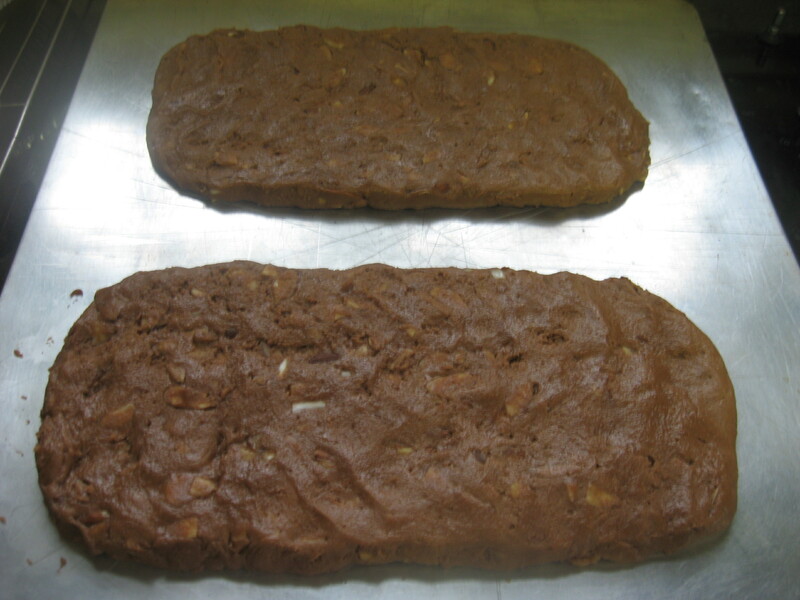 Begin forming your first piece of dough on an ungreased cookie sheet. Mold and shape the dough with your hands into a 10 inch long roll. Do the same with the other section of dough and keep each roll about 4 inches apart on the cookie sheet. Place in the oven and bake for 30 minutes. Remove from the oven and allow them to cool for 10 to 15 minutes. Here is the trickiest part about this recipe – removing them from the cookie sheet. The easiest way I found to do this was to take my off-set spatula and glide it slowly along the bottom of each piece of dough to loosen it from the sheet. It was easy enough to do, but you MUST be cautious while doing it that you don’t disturb the underside of the dough. Once I had it loosened I just slid them on to a cutting board. 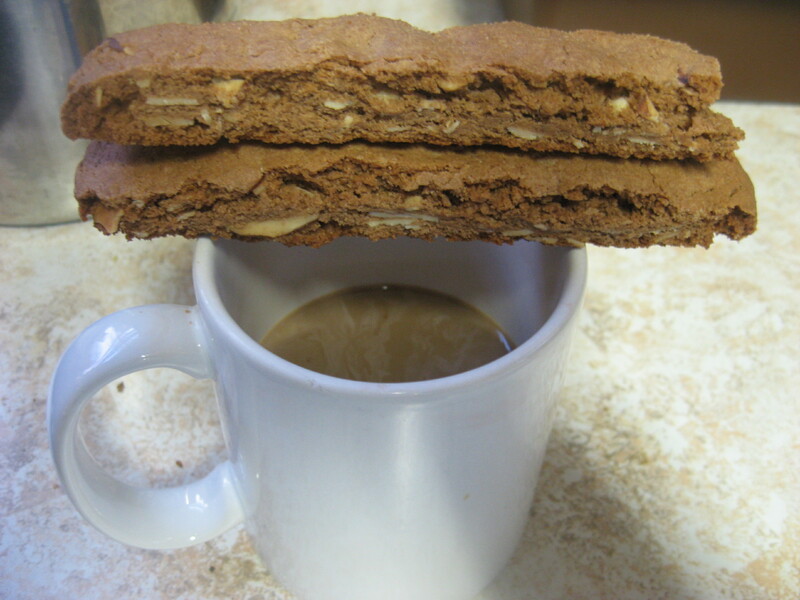 You will want to do the sliding very slowly as well or your large cookie is going to break. Using a serrated knife, – I found a steak knife worked best – use a sawing motion and cut each individual biscotti in 3/4 inch wide pieces. After they are all cut, return them cut side down to the baking sheet and place them back into the oven to bake for 12 to 15 minutes. Take them out, turn them over and bake on the other side for another 12 to 15 minutes. These are not soft middle cookies here, folks. You want them crisp and crunchy. Once they are done, take them out to cool on a wire rack. DO NOT make a pot of coffee while you are baking these because you may end up eating an obscene amount of them while waiting for the rest of them to cool. Not that I would know about that…I’m just sayin’! Store in an airtight container for up to a week. These are light, crunchy, and delicious! Even my youngest son, who hates nuts and cries when I put them in cookies or brownies, ate a handful of these! That’s how good they are! Note: In my picture you can see the almonds I used were sliced although the recipe calls for slivered. Sliced was all I had on hand the day I baked these, and they worked out well. Since I’m a lover of big crunchy nuts I do plan on using the slivered next time I make these. Even whole almonds would be great! I work nights and my three-year-old daughter hates that. I hate not getting any sleep. Most days after returning home from work I do get to catch some z’s, but it all depends on having someone to watch the kids to do that. If my husband is home, normally I get to catch up on my sleep. Or if I have my parents babysitting for me. But sometimes sleep has to wait a few hours. Yesterday was one of those days. I hate those days when sleep has to wait. In my 20’s I could stay up all night and make it through the next day. In my 40’s, that doesn’t happen too much. In fact, it rarely happens at all. I need sleep, and I need it as soon as I walk in the door. I was sadistically tempted to call my husband on my way home and tell him that I had gotten stuck at work. Just for fun. But I couldn’t be that mean. I knew he would be ready and waiting to bolt out the door the minute I walked in so I decided against my cruel joke. And as I expected, I walked in and he left. Luckily my daughter was still sleeping so I was able to lay on the couch for an hour and sleep. It was a very short hour. I woke to a little person standing next to me and staring at me with her big brown eyes. Here is all I can remember from that conversation. I dragged myself from the couch, filled a sippy cup that looked somewhat clean and returned to the living room. Thinking she was now content, I snuggled myself back into the couch. I hauled myself back into the kitchen, fixed her a plate of toast with peanut butter and returned to my cushions. She couldn’t want anything else. She had gone to the bathroom, her favorite show was on, she had her juice and toast. All would be wonderful and I could lay in comfortable bliss for a while. I felt a presence hovering over me but chose to ignore it. Has anyone ever told you it is impossible to ignore a three-year-old? If they haven’t, let me tell you now that you can’t. She had found her brothers whistle straw and was happily making music with it while sitting perched on my torso. I knew if I kept my eyes closed it would stop. The sound would go away and I could return to my dazed, semi-dozing state. For the love of all that’s good I knew it was over. There would be no blissful sleep. Not even a little semi-dozing sleepless state either. This wouldn’t end and I had to acknowledge that. Within moments we were in the kitchen playing Betty Crocker and whipping up some cupcakes. “Pink ones.” She advised me. Of course. Pinkalicious is her new favorite book to have read to her. If you have young girls and have not found this book yet you are missing out. It’s adorable. It’s pink til you puke cute. I scrounged in the cabinet and luckily found some red food die. We whipped a few drops of it into the frosting and away we went. 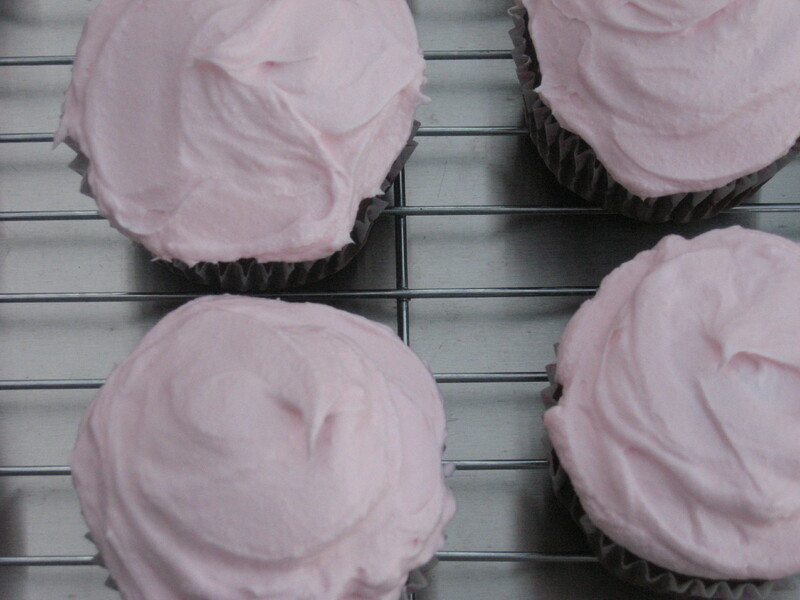 We let the cupcakes cool and frosted them with pink fluffy frosting. Then we ate all twenty-four of them. That’s a lie. She ate one and I ate two. Shortly after I cleaned up the kitchen my husband and sons returned from hunting. I cried from the sheer happiness. I could sleep now. So off I headed to my bed that was still calling lovingly to me. Wow! Only two! He further explained the reason he held back on eating more. You will understand this statement if you have read Pinkerella. If you haven’t then I’m sorry, I just can’t explain it to you now. There is no recipe for these cupcakes. Well there is, but Berry Crocker owns it because it came out of a box. As for the frosting, Wilton owns that recipe. I hate buttercream icing. I have searched for years for a fluffy buttercream that does not taste disgustingly sweet and that leaves that nasty buttery residue on the inside of your gums after eating it. I’m still on the quest for the perfect frosting recipe that is light and delicious yet still holds up well for decorating. Until I find it, I will continue to use Wilton’s Whipped Frosting. It holds up well, tastes great, and is super easy to mix up and color. The good news is there are still a few cupcakes left. 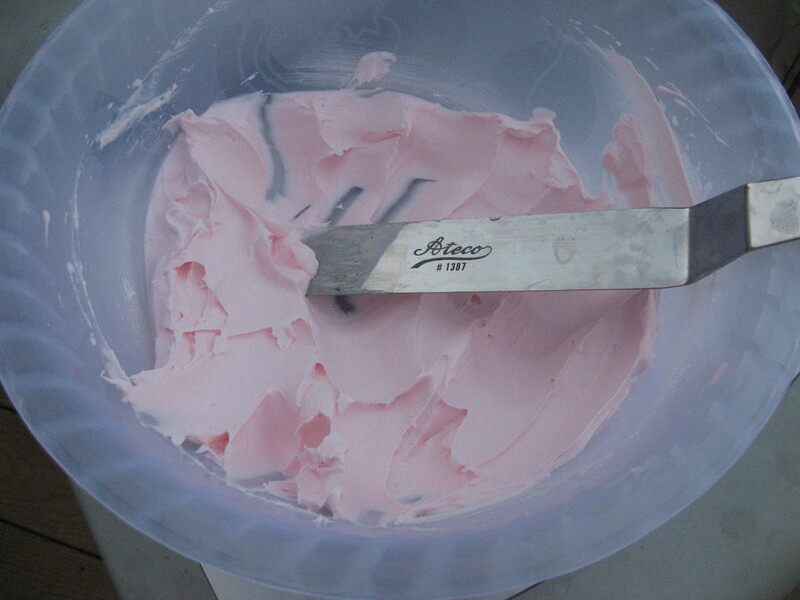 Nobody has turned pink, including me, who has eaten more of them than I should have, and I still have some frosting left. I’m undecided on what to do with this little bit of frosting. Save it in the fridge? It’s not enough to frost another twenty-four cupcakes with. Or maybe just stick a spoon in it and finish it off. I’m thinking that last suggestion may win out.